The purchase of these materials will pay to send a special needs child to Camp! When children are struggling with anything, particularly an instrument, they forget that learning can be fun. They need to be reminded that they are “playing,” not “working” an instrument! A CaChoo is a fun symbol of accomplishment, no more than a line drawn by a child on a page* with a flourish. We exuberantly exclaim “CaChoo!” in order to inspire him or her to practice and to “do it again” until the material is mastered. 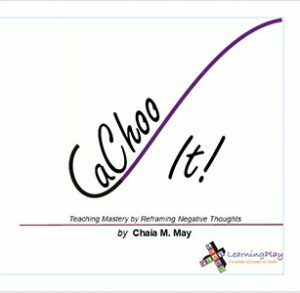 Mastery can be an abstract concept but the “CaChoo method” makes it concrete: the children know they have to “get” it on their own and eventually play it with no mistakes. 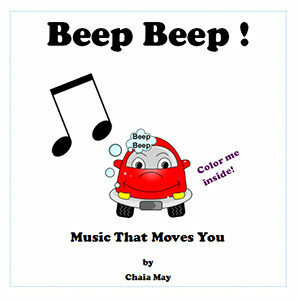 How better to get children’s attention than with the sound of a train, car or another vehicle? 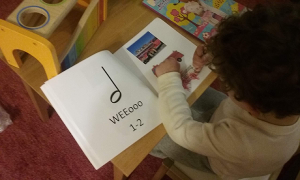 Tying these familiar images and sounds to musical notations connects children to musical language in a lively way. Learning the meanings of the notations and linking them to cars, trucks and trains helps with recall. This way, the children can recognize the musical symbols after only one reading by associating each one with the colorful, beloved objects. Their learning is further reinforced when they color each object left blank. 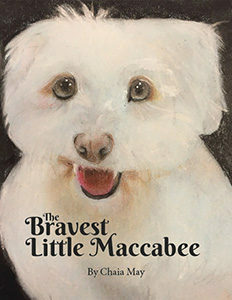 This book is based on a true story of the life and death of Maccabee, a family’s beloved dog. We hope it will help families deal not only with the loss of a cherished pet but also facilitate discussions that enable young children to cope with the death of anyone they love. Readers have said that the story helped them prepare in anticipation of losing their pet by using the phrasing to explain to a young child that someone they love has passed away. I hope that this tale will also give parents courage to share their own feelings openly and create sacred moments around the rituals of loss. These moments may be the ones that the family will cherish most when they look back. Jewish Morning Prayers and Original Poems for the Very Young. You may download and print this order form, or contact Chaia with any questions.